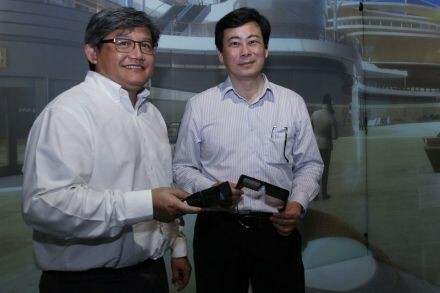 AT last week's pilot training course for Singapore Airlines Ltd's Scoot carrier, Eva Maria Thien stood out among the participants because she was the only woman. She also was the instructor. She's a rarity in the male-dominated world of pilots. Just 3 per cent of pilots worldwide are female, and in Singapore, where Ms Thien is based, the figure is about one per cent. By comparison, women make up about 23 per cent of the leadership ranks at technology companies like Facebook Inc and Yahoo! Inc.
Ms Thien broke through with a blend of determination, skill and love for flying. She was willing to bide her time and work her way up in Europe until she was promoted, before moving to Asia. She wants to see other women follow in her path and break down the cockpit door. "When things get tough you really, really need to work hard," said Ms Thien, 50. Women in aviation tend to be confined to the back of the plane, serving snacks and sodas. They represented 80 per cent of flight attendants in the US in 2013, little changed since figures were first available in 2005. About 5 per cent of members of the Airline Pilots Association are women, in line with the level of female pilots at carriers including British Airways Plc and Deutsche Lufthansa AG. Among Singapore-based carriers, Ms Thien is the sole woman who flies widebody planes. "Asian society is still behind in gender equality," said Shukor Yusof, founder of Endau Analytics, an aviation consultant in Singapore. "It is beneficial for airlines to be seen as promoting more women to join the industry not just as cabin crew." Scoot said in an e-mail that it welcomes all qualified pilots, regardless of gender. Ms Thien showed signs as a toddler in Graz, Austria, that she would take to the skies. "I was told from very, very little I walked around and told everyone" that "I will fly aircraft," she said. The turning point came at age 22 when she asked a pilot friend to take her on a Cessna, her first time in an airplane. "It was absolutely fantastic," she said. "It felt very natural." She signed up for a cadet flying programme with Austrian Airlines AG and was rejected at a time when it was "quite unusual" for women to apply. She then obtained a degree in English literature and physical education and became a teacher, before joining Lauda Air as a flight attendant while taking private flying lessons. She started her pilot career at Italy's Air One SpA, followed by a seven-year stint with low-cost carrier Volare Airlines, where she rose to become a captain. "It was a challenging time in many ways because it was a company where there were many, many military pilots," Ms Thien said, referring to Volare. "I learned a lot from the bad things and I learned a lot from the good things. I just had the whole spectrum of reactions and it made me work really hard." Ms Thien said that she was overtaken by colleagues who were promoted to captain more quickly. Undeterred, she worked even harder to show the bosses her ability. "It was very frustrating then, of course, but in hindsight it was good," she said. "I breezed through the command course simply because I had a lot of time to see others do their command course, so it worked out very well." A chance sighting of a Tiger Airways Holdings Ltd hiring ad took her to Singapore. She joined Tiger in 2005 and stayed for almost seven years before moving to Scoot. 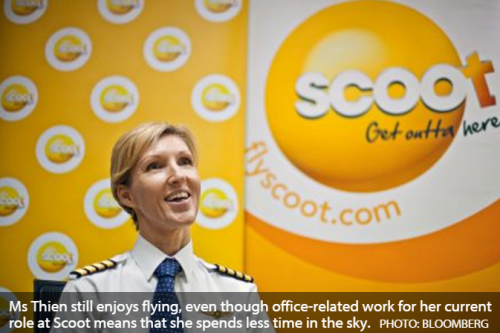 Ms Thien joined Scoot's second batch of pilots in February 2012, becoming its head of training in April 2014. "If you know your stuff, if you are prepared, there's nothing to challenge," said Ms Thien, whose masters degree project at City University London was on South-east Asia's female pilots and cracking the glass ceiling. "I don't take shortcuts, I work doubly hard." She still enjoys flying, even though office-related work for her current role means that she spends less time in the sky. Last September, she was invited to talk to a group of grade-school girls under a programme challenging gender stereotypes in fields such as science and technology. She wants to keep sharing with kids how much she enjoys flying and how they - both boys and girls - can too. She says that the aviation industry is overlooking some of the best talent by not hiring more women as pilots. "I realised a lot of these girls had never thought that being a pilot was a possibility," she said. "Sometimes you hear very strange comments, like 'girls don't want to be pilots.' Nonsense."